Company Culture Profile (CCP) is a reward for Platinum and Diamond members in VietnamWorks’ Customer Loyalty Program, which helps Employers to communicate their company culture and branding to potential candidates and attract right talents. <I> Company Culture Profile’s benefits? 1. Employer branding. Communicate well company culture to the large VietnamWorks database of millions job seekers with thousands new acquired every year. 2. Attract professionals. Build up company talent pool. Successful hiring by finding the best-company-match candidates. <II> How about Company Culture Profile’s duration? The duration of CCP is 6 months for Platinum customers and 12 months for Diamond customers from the 1st launch date. In case Platinum customers upgrade their level to Diamond, the duration will be extended 6 months upon request. <III> How to use Company Culture Profile? To redeem it, Customers need to confirm with their respective consultants and provide all required information for CCP defined in a predefined profile template. <IV> After content and candidate management’s duration has ended, what happens to Customers’ Company Culture Profile? After this duration, if Customers are not using any VietnamWorks Company Culture Profile service package, CCP will be online but content and candidate management will be disabled. <V> Which information on the Company Culture Profile can be edited? All CCP content including text and images in sections: Company basic information, Our Office, Our Story, Our People, Our Benefit, Coding Practices & Tech stacks (for IT Company profiles) are editable by Customers from VietnamWorks Employer site during the CCP duration. <VI> How many jobs can be displayed on Company Culture Profile? Do they have to be currently online on VietnamWorks website? Can they be changed? As many as published at VietnamWorks. By default, all jobs posted by all these Employer accounts and not expired yet in VietnamWorks will be auto-integrated and shown in the CCP. Customers can request to remove jobs posted from some Employer accounts in the CCP if necessary. 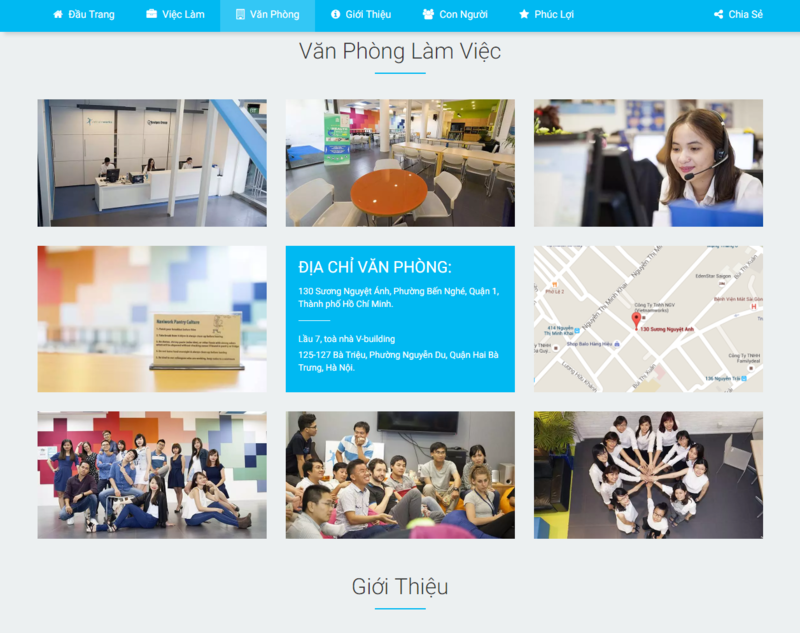 <VII> Can Customers request VietnamWorks to design Company Culture Profile based on their own style and format? No. However, each profile can be strongly branded emphasized by company logo and its own branding theme color. <VIII> If 1 Company Culture Profile contents many jobs from other different users, which one will those applications go to? 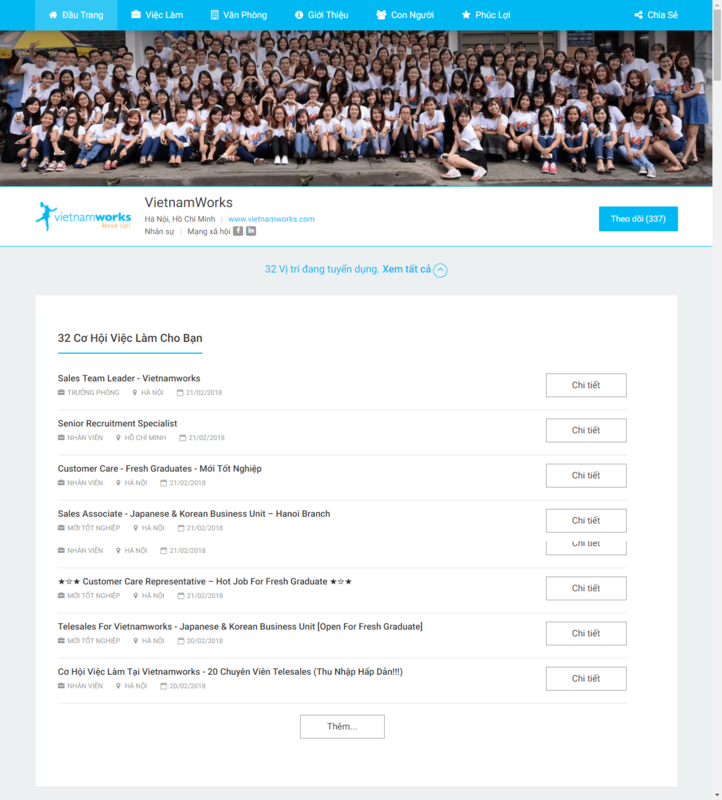 For jobs on CCP are linked to VietnamWorks website so when candidate apply, their resume will be sent directly to user which contents that job.